What’s special is this: no bird can sing of an autumn sunrise or of sound of the crashing waves, although we and they equally feel it, and our lives depend upon it. Our greatest strength perhaps lies in understanding what gave birth to us, and to them – indeed to all of us – and in respecting that wisdom than manipulating it for devious purposes. Man’s mark on human evolution, and the history of our entire planet, has so far been earthshaking. What creature would evolve to be as this? If there is a God, why would God create such a creature? If there is no God, why would nature carve a pathway for the evolution of such a creature, only to destroy itself in its pursuits? And yet I carry a pessimist’s optimism, that man has a beautiful brain – as beautiful as an orchid or a bird of paradise, or a honeybee or a tiger, because, given a choice, he can understand that life is more than just man-made illusions. There are regions worth getting lost in to be found, should you decide to come out of the illusions which pretend to protect us. How else are we different with our beautiful brains, then, from the scorpion wielding a sting to hunt, or the ruminant with a specialized stomach? I spent a considerable amount of time in the countryside of Kanha Tiger Reserve this year, more amongst people who live with the forests than without, and as I sit by the campfire at the end of the year, I reflect upon the seasons that went by and what the seasons that follow will bring. I could capture some moments in pictures which I share here, some in writing, but most remain in my heart. Winter is the season when the young are old enough but still too young to leave their mother’s side. I observed this Chital (Axis axis) fawn embrace its mother, and the doe, so very kindly, acknowledged by preening its neck one cold January morning. Gondus was a Collared Scops Owl (Otus lettia) fledgling rescued from local hunters and taken care of for several days until he succumbed to its wounds from a broken wing. Its mother, Venus, was cared for until she could defend herself and was released back into the wild. Owls are heavily hunted in India for preposterous superstitious reasons. While man digs for gold and diamonds underground, he so ignorantly ignores the treasure that lies in front – that which gives him life – the serenity of nature. Most pristine forests today rest over ores and oilfields, their very existence their doom. The Hard Ground Barasingha (Cervus duvaucelii branderi), famed for its mighty branched antlers, is a subspecies found only in Kanha, and was driven to extinction because of rampant hunting. Thanks to stringent conservation measures, it is one of the success stories of India’s conservation movement. This stag probably lost an antler in a fight with another. Barasingha move in herds dominated by a stag and include several females and fawns, and young bucks. The meadows of Kanha eclipsed by the giant Sal trees are the finest habitats for these vulnerable species of deer. Palash (Butea monosperma) is one of the few trees to give colour to an otherwise drab monochrome of the summer of the Central Indian Highlands. A set of flowers resembling oil lamps hangs from the lower branch along a perennial waterhole. Kusum (Schleichera oleosa) explodes in warm colours by the end of March as it sheds leaves, and just as suddenly springs into shades of deepest reds as new leaves sprout. The spring of Kusum emblazes the forests of Central India during summer, and the sight of seeing one ablaze in the summer greens of Sal is a sight for sore eyes. 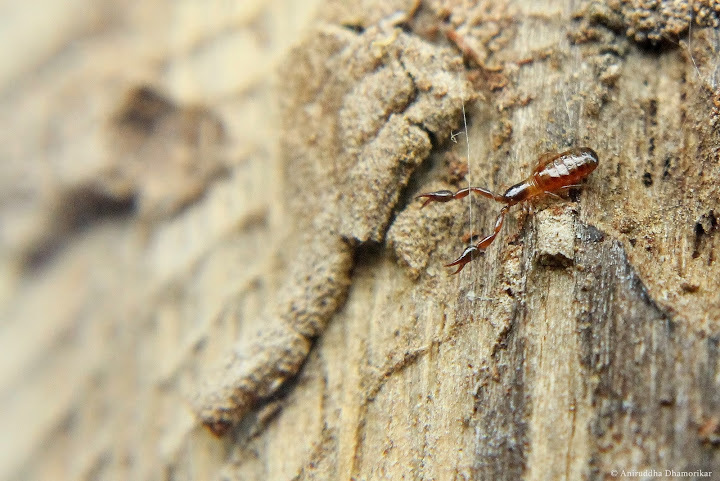 Weaver Ants (Oecophylla smargdina) are primarily arboreal ants, making nests on trees using leaves and tending to bugs that secret honeydew, but they are also fierce fighters and opportunists, capable of taking down a number of living things they can empower, including this bark scorpion. As temperatures soar over forty degrees and waterholes shrink, animals start flocking together and can be seen in huge congregations, a scene reminiscent of mighty migrations of African and American continents. A herd of Chital over 114 individuals strong trod over this hillock looking for sparse green grass one summer evening. 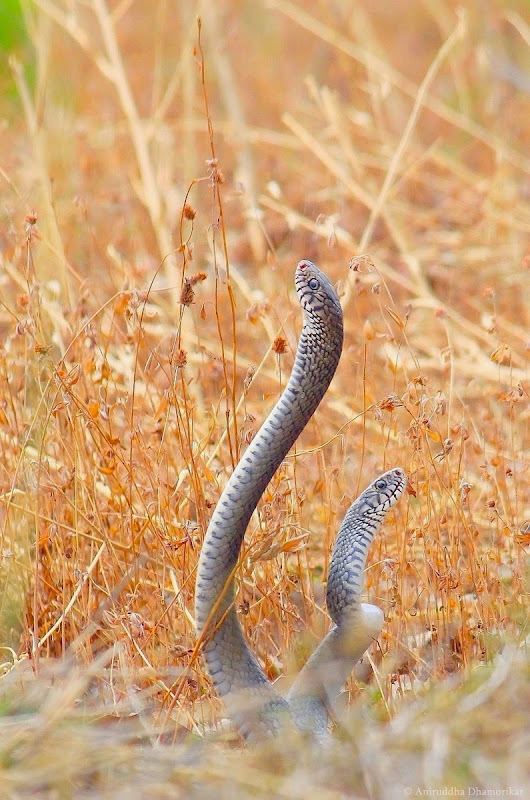 (Indian Rat Snake) mating with a Nag (Cobra), and that the offspring of these are deadlier. Gaur (Bos gaurus) is the largest of Bovids of India, and a herd of these gentle giants is a sight to see. We came across a large herd of cows, calves, and young bulls in early June when the rains had cleared the dust off leaves, led by this giant bull with a wall of muscle, bearing scars on his face from many a battle. There are many secrets the jungle holds beside the most magnificent, and most of these secrets lie hidden. Pseudoscorpions are one of the least known Arachnids and best kept secrets of Kanha that have found their own niche amongst the tigers and spiders, both supreme predators of their respective niche. Millipedes, although fairly common throughout the world, are one of the least appreciated groups of organisms, and play a vital role in the undergrowth. Their courtship is nowhere short of romantic. Here, a Polydesmid male gently climbs and holds a female, and using his modified pair of legs called gonopods, caresses the female in a graceful embrace. 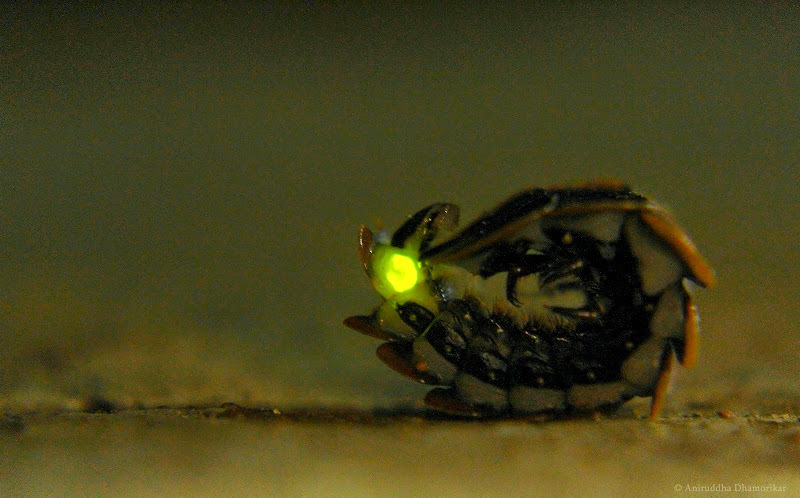 Females in some species of Firefly (Family Lampyridae) retain their larval stage after maturity and attract males by flashing a fluorescent bottom. Large females such as the one coiled up in defense are a common sight on Kanha’s forest floor during monsoon months. it is naught but Kaans (Saccharum spontaneum). predation usually mimic from tail-to-head (in that order) so that the tail-end resembles a head. Amyciaea, a predator, uses the tail-to-head mimicry, which is uncommon for a predator. In this picture, a Phoerid fly shares the hunt. Spiders of Central India are diverse in their size, shape, colour, and methods of hunting. with a female relishing upon a honeybee she caught on the other side of her web. 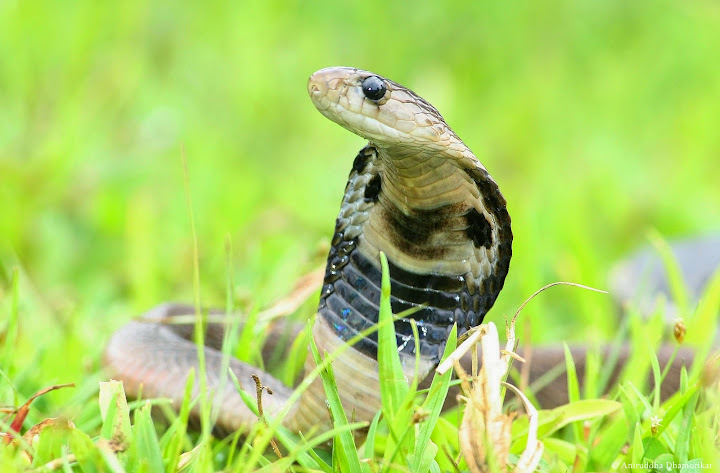 One of the most common venomous snakes of Kanha is the Indian Cobra (Naja naja), also called the Spectacled Cobra. This young fellow sought shelter in a motorbike in the morning after sensing movement of people around, and was rescued from it after a whole forty-five minutes of searching. The essence of sunrise or a sunset lies in simply watching it, no matter where you watch it from. Seeing the sun rise over the vast forests of Kanha creates an illusion of what I call the Endless Forest Effect. This landscape however is intermingled with villages, fields, pasture lands, and roads, waiting to encroach through the network of trees. To see a tiger is to see everything an ecosystem stands for. 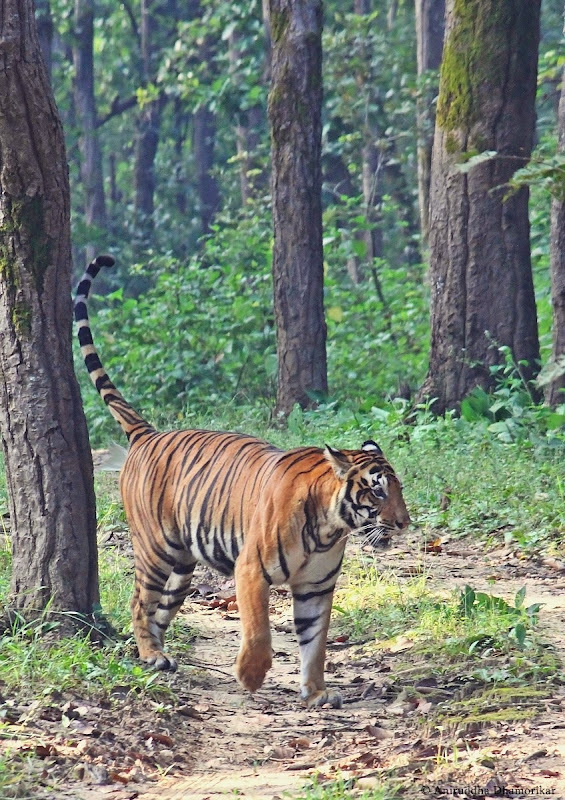 Very rightly the epitome of an ecosystem, tigers are now more of an epitome of management. her call reverberating through our hearts long after she had vanished. The namesake of the Tiger, Common Tiger, Danaus genutia, also called Striped Tiger, nonchalantly flaps its wings to touch-base with one of the last flowering Crotalaria shrubs before the onset of the cold winter months. The entirety of this web of a Pholcid spider contained tens of mosquitoes, a part of this in the photograph shows mosquitoes in the genus Aedes and Anopheles, both carriers of malaria, and several midges, craneflies, and a planthopper fallen prey to the spider. Kanha’s southern region is rife with malaria, and spider-webs serve as efficient traps for mosquitoes. In this picture, two Milichiid flies feast on the remains. By the end of the year almost all the plants that grew through monsoon have produced seeds. During the cold and dry season of winter, they ripen and are ready to disperse. 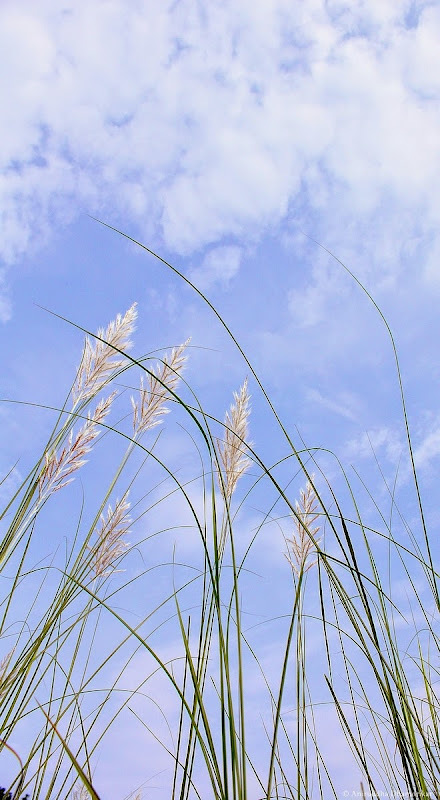 Some grasses, such as Heteropogon contortus, locally called Sukda Ghaas (in picture), rely on winds and sporadic rains to unfurl their seeds and be ready to latch onto any passing animal. A few drops of water send this bunch of seeds tangled by their awn into a spin, unraveling themselves as they dance. My window offers a decent view of the sun setting over a crowded treeline. Every evening casts new shapes and colours, and performs sunset displays each different than the previous. Winters offer the best spectacle during the setting sun, and are a fine ending to a fine year, but also a fine prelude for what’s to come. The year – if it may end, if it should end – should always end with a spectacular sunset.